New research shows that walnuts might top the list as the healthiest nut. When craving a healthy and satisfying snack, nuts may be one of the best foods to turn to- and according to new research, some types are even healthier than others. A recent study published in the journal Food and Function showed that when compared to nine other commonly consumed nuts, walnuts have the highest antioxidant potency. Walnuts are the highest in a group of antioxidants called polyphenols, which current evidence strongly supports can help prevent cardiovascular diseases, cancers, osteoporosis, neurodegenerative diseases and diabetes mellitus. Other foods that are rich in polyphenols include red wine, green tea, and blueberries. 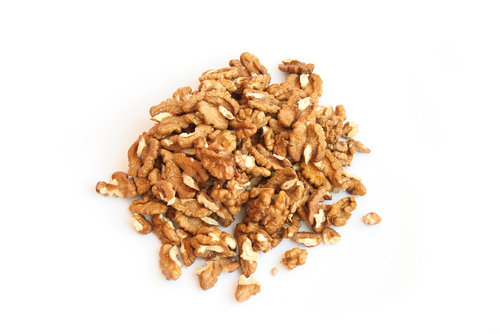 Walnuts not only provide the added benefit of these disease-fighting antioxidants but are also rich in omega-3 fatty acids which are needed for healthy neurological function. Though research does support that walnuts are one of the best nuts when it comes to health benefits, this doesn’t mean that other nuts are unhealthy. In fact, all nuts are high in healthy monounsaturated and polyunsaturated fats which can lower the odds of heart disease and heart-related deaths. Many clinical studies have shown that nuts can prevent artery inflammation and lower LDL cholesterol, the kind associated with an increased risk of heart disease. Nuts are also a good source of protein, which when paired with a grain such as bread or crackers, can provide a complete protein source for vegetarians. The protein and healthy fats in nuts also help us feel full so they serve as a great snack to hold us over between meals. Try throwing some into low fat yogurt or on top of cereal, spreading nut butter on whole grain bread or crackers, or pack trail mix with dried fruits and nuts in a plastic baggy to bring on the go. Look for unsalted varieties to reduce sodium intake, and remember not to go overboard as nuts are a high calorie food. One serving contains about 190 calories and is about ounce. This is one handful, or ¼ cup shelled walnuts (14 halves), or about 23 almonds. “Coffee Is Good for You” by Robert J. Davis, PhD, by arrangement with Perigee, a member of Penguin Group (USA) Inc. Copyright 2012 by Robert J. Davis, PhD, MPH.